Bit of a change of plan. Following a chat with a fellow beekeeper, and the suggestion that combing over should not be an issue at all and was quite normal, I decided that I should try to raise all three queens separately. This was also helped along by the fact that I have a mean colony in one hive and a suspected failing queen in another. Now previously I mentioned that I had prepared some mating nucs, so this seemed the solution here. Looking at the frame the comb had increased overnight and now the cell I though was good because it was clear of extra comb was now linked to the neighbouring cell and starting to get its own covering. I cut between the paired cells with a stanley knife and then pried the combed over cells from the bar, leaving the partially covered cell on the bar and putting it back in the original hive. Actually I left a step out there, I prep’ed and filled the mating hives with bees, using a correx nuc box to shake a commercial frame into each box. 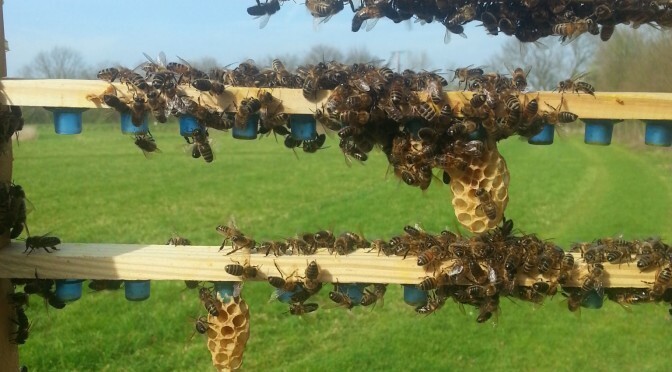 I put each cell into a wire cell protector, because I didn’t have comb on the bars in the mating hive and needed something to hold the cell. The entrance dial on each of the nucs was then turned to ‘vent’ to keep the bees in – don’t worry they had lots of fondant to feed on in the rear compartment. The bees will be let out tomorrow once they have acclimatised to their new home and queen cell. Given the timetable of events the queens should hatch on Monday or Tuesday; I’ll pop back on Wednesday to see what has hatched.